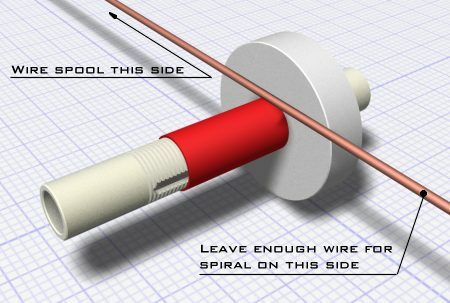 The following figures show a method(1) of forming a multilayer coil which produces a neat winding. The most complicated step is producing the spiral as it requires tacking with adhesive at regular intervals. The most suitable adhesive for rapid winding is cyanoacrylate (superglue) and obvious care should be taken to avoid sticking fingers to things. Cyanoacrylate may not take well to some surfaces so experiment before attempting to wind your prototype. If cyanoacrylate won't work then the next alternative is to use a fast setting epoxy. 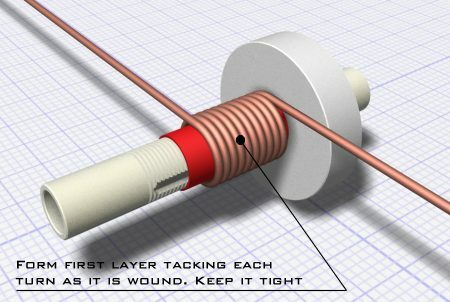 You will probably need to hold the turns of the spiral with some sort of grip to allow the epoxy to set, unless you wish to apply finger pressure for the duration of the curing time (not recommended!). Clothes pegs may work well for this. 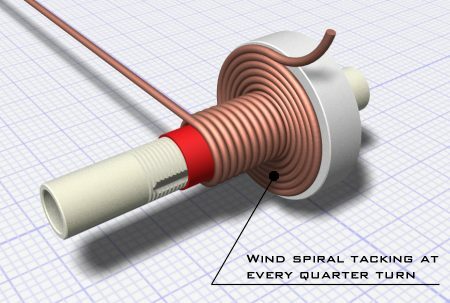 Once the spiral has been formed the remaining layers can be wound back and forth to complete the coil.